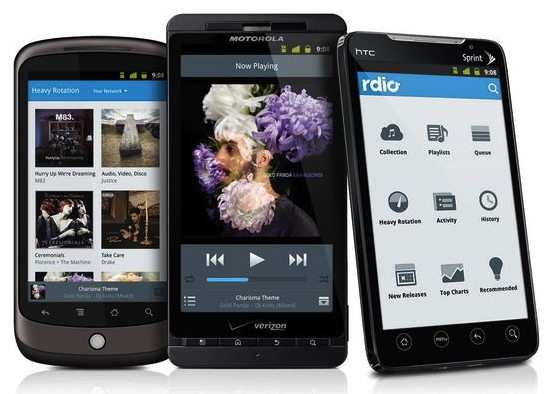 Rdio, a music subscription service offering more than 12 million tracks, released a new Android(s goog) client on Monday. The application is a full re-write of the software, rather than an update to the existing code, and better supports Android 4.0 smartphones and tablets, allowing the app to be controlled on a device’s lock screen. I switched away from buying digital albums to Rdio’s $9.99 a month subscription several months ago and find it to be a great way to enjoy music. Before you ask why I chose Rdio over Spotify and others: Rdio offers a discounted family plan that its peers don’t. As good as Rdio may sound, however, its previous Android client reminded me of Android 1.6: Mostly functional but not pretty to look at. The new client, however, looks stellar and adds features that bring it up to par with Rdio’s app for Apple iOS(s aapl). The navigation interface is much improved, with one-click access to most functions. Support for browsing new releases, the top charts and Rdio’s recommendations — based on your listening history — are now part of the software, as are the social components. You can now see what other friends using Rdio are listening to and it’s easier to see which tunes you have stored for offline use. While the app is improved for all supported Android platforms, I especially like the support for remote control clients, which was added to Android 4.0, or Ice Cream Sandwich. That means the album art and music controls are available on the lock screen of an Android 4.0 device; handy when I’m running with my Galaxy Nexus. All in all, this is a must-have upgrade for Rdio users on Android. The only issue I’ve had so far is more of a nuisance than anything else. Once I upgraded to the new version, Rdio had to re-sync, or download, all of my offline music tracks again.